Project Debut Carbon. Manual Turntable OM10 (with cover) (With Cartridge). It is the ideal starting point to discover / rediscover the unmistakable sound personality that for decades has been - for many enthusiasts still is it - the high quality audio format par excellence: the vinyl record. Created by Pro-Ject, an Austrian company that from the beginning decided to extend to the bulk of music lovers a product concept that has traditionally been almost exclusive to minorities, the Debut Carbon DC OM10 is a magnificent display of the idea of Intelligent simplicity and, at the same time, in the service of the function because its designers have been able to combine high quality materials with immaculate finishes and, above all, a series of technical solutions that until now were closed reserve of much more expensive products . Among these solutions, the use of a reading arm made of carbon fiber, a material in which Pro-Ject has become a recognized expert, shines in its own light. A high density agglomerate base whose composition has been specifically designed to minimize the effects of vibrations, and a high mass metal plate contribute powerfully to the capture of the infinite subtleties contained in the groove of the disc is carried out with Absolute reliability. A mission that is reinforced by a very high precision continuous power supply, a mechanically isolated motor of the reading system and an advanced traction belt, all of which parameters make the rotation of the disc is carried out with extraordinary stability. This is also supported by the original OM10 movable magnet pickup capsule, which takes advantage of the unique experience of a live audio legend, the Danish company Ortofon, to offer musicality and resolution at an unbeatable price. 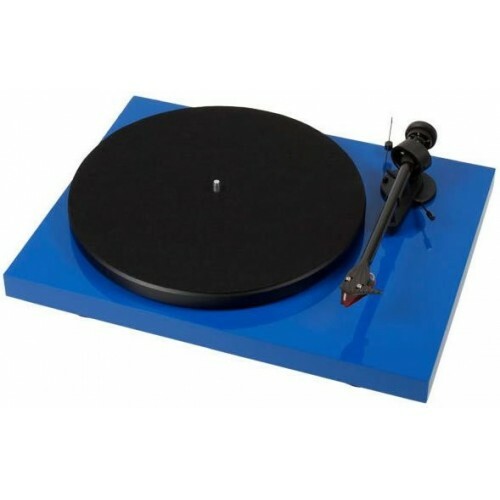 Turntables of high performance and exceptional value for money. Belt drive (33 and 45 rpm). Pro-Ject exclusive carbon fiber arm. High precision external power supply. Motor suspended in thermoelastic rubber (TPE). Metal plate of anti-resonant construction and sound-absorbing mat. Mobile magnet capsule (MM) Ortofon OM10 supplied as standard. Available in 7 lacquered finishes. Dimensions with lid closed: 415x118x320 mm (W x H x D).